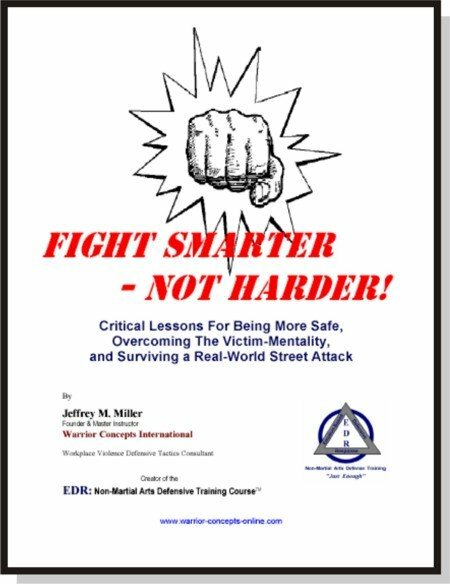 Are you looking for solid information about street-fighting self-defense? Well Now You Can Learn What it Really Takes to overcome a bigger, stronger, brutal, and more powerful assailant, by using what you already have but in a whole new way?! Every day, millions of people go to a self-defense or martial class in the hopes of learning some real skills and knowledge that will allow them to be able to defend themselves should they ever be attacked. And every day, more and more of these people drop out of their classes because they realize that what's being taught... ... doesn't work! Hi, my name is Jeffrey Miller, and I teach people how to not die at the hands of brutal attackers in today's often unsafe world. In fact, I've been training, researching, and proving what I teach on the streets as a police officer, undercover investigator, and bodyguard for over 30 years. ...you're on the wrong web site. "Fight Smarter - Not Harder!" ...and it's about just that. ...fancy martial arts styles and unproven theory are the LAST thing you need! You MUST last longer than your opponent. And when he is bigger, faster, and stronger than you (or there's more of them), you can't afford to take any chances - you can't hope that what you're learning from some guy with a black belt and a few tricky moves is going to work when you're being pummeled, stabbed, or brutalized by a human animal. Don't get me wrong. I have a black belt, but not in a sport karate type system that bases success on "points" or how good your Kata ('prearraged string of moves') looks! The point is that... Not everyone (few in fact) wearing a martial arts black belt or teaching a self-defense class... knows what he or she is doing! 1. Aiming for the BEST Targets in a Self-Defense Situation! "Fight Smarter - Not Harder!" calls on my 30+ years of experience as a police officer, undercover investigator, private detective, and body guard - professions that required that what I learned HAD to work - Every Time. First, I'm running a special promotion to get as many new members onto my newsletter list that I felt that it was only right that I gave you something with lots of value in exchange for your trust. I normally sell this report for $7. And, I'll be putting it back up for sale at the end of this promotion so, if you want a copy without paying for it, you'll need to get it now! Second. You probably don't know me, or how I'm different from most of the people here on the internet passing themselves off as self-defense experts. So, what better way for me to prove my worth, so-to-speak, than to give you a sample of what I offer my best and most serious students? I am supremely confident that, once you read this report and put some of the lessons to work, that you'll want more from me. Do you navigate away from this page and the information in this life-saving report?